Top 5 VR experiences (and they’re cheap, too)! Unlike videogames (which most people understand, even if they don’t at first see how they fit into special events until some explanation on my part why people love it and how awesome it is), VR is something most people obviously have not tried yet. I was completely skeptical of the new wave of VR, but all it took was this one video my friend made me experience on his brand-new Samsung Note 4 + Gear VR headset to make me see the light. [youtube]https://www.youtube.com/watch?v=XM7pV-2qhCM[/youtube] I show this video to everyone since the Gear VR is portable, attaching to your flagship Samsung phone (and the headset is only $100). People think it’s cool when the video starts … then I say, turn your head to the left! “Oh wow, it feels like this guy is talking right to me!” Then I say, turn around, you can see people cleaning the back of the theater! It’s a simple, short, and completely effective way to get you to understand what’s so amazing about VR: It transports you to another place, immediately. 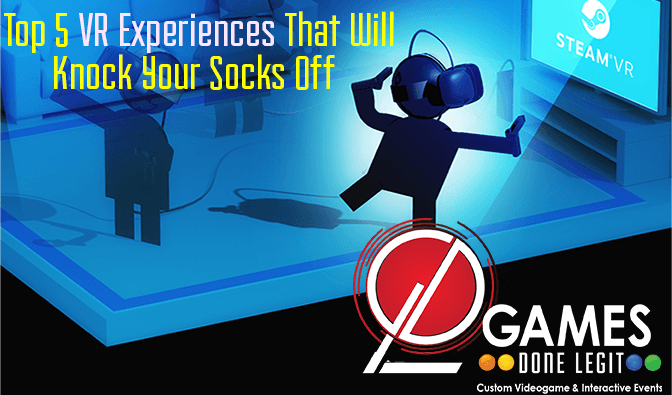 This top 5 VR experience is best for introducing VR to anyone (gamer or non-gamer) for the first time. YouTube hosts are always artificially getting hype and freaking out. This guy is no different, but in this case the game warrants it. Just mute this video and you get an amazing idea of what it’s like to train with Neo in the Matrix to fight in the theorhetical good sequels. [youtube]https://www.youtube.com/watch?v=RoNMZKjAHNU[/youtube] In your 2m x 2m area, you can fully move and dodge (you get bullet time when lasers get close to your body) while you shoot back at little remote robots with your two guns. With six different weapons and the option to wield a shield instead of a gun, the arcade-like gameplay is something you can enjoy over and over. And it’s replaced Dance Dance Revolution as my favorite daily exercise! Top 5 VR for sure, and maybe top VR videogame available right now. Have you ever wanted to wield a lightsaber (rhetorical question, obviously)? Even as LucasArts forgot how to make great videogames after the ’90s, this random developer beat them to the punch with a lightsaber sim. It goes without saying this is almost by default top 5 VR. [youtube]https://www.youtube.com/watch?v=Ead1j5jDRF4[/youtube] It’s super short, and once you discover a game-breaking glitch you can beat every stage with no skill, but you’re blocking laser shots like a Jedi. That’s worth the price of admission over hundreds of $60 AAA titles out there right now. Plus half the fun is seeing the amazement on your friends’ faces when they’re transported to the Millenium Falcon to face off against Luke’s remote! You know how I said the Cirque de Solei video shows how VR totally immerses you to feel like you’re somewhere else? Try the Oculus Rift Dreamdeck (which is free from Oculus Home) and you’ll experience that feeling in a completely different way. I really don’t like heights. I’m not going to turn into a blithering mess if I’m up high, but I just prefer to not look down. In the building experience in Dreamdeck, you’re placed atop a huge building in a huge city — and I dare you to walk off the edge! VR is being used to treat phobias and for meditative and healing purposes, making this building sim easy top 5 VR! Following video contains NSFW langauge and a dad flipping out [youtube]https://youtu.be/TA3u7kdws3M?t=87[/youtube] Seriously. You know you’re safe in your home/office, but you feel afraid to even look over the edge. It made my palms sweat profusely and I would not walk off that edge for a billion dollars. It made me think of another quote from The Matrix: “Your mind makes it real.” It’s a powerful reminder to what this new technology can make us feel! I remember seeing LaserDisc educational programs in grade school for the first time, and it seemed so amazing you could queue up different parts of a lesson on disc, and see things presented in a way VHS or TV couldn’t do. Now picture being able to visit an art museum with technology so good you feel like you can examine the quality of the oils in the painting. [youtube]https://youtu.be/g9prXexRjrQ?t=74[/youtube] That’s what Woofbert is achieving, and it immediately made me realize this is top 5 VR material because VR isn’t just the evolution of videogames. It’s the evolution of everything. It’s going to help those with physical and economic limitations experience more of the world. We’re working with Hattle Larlham to improve quality of living for their residents, who suffer a range of severe maladies from partial paralysis to severe autism. Virtual trips to famous museums is much more cost effective and in some ways is the better experience because of how close you get to the artifacts! 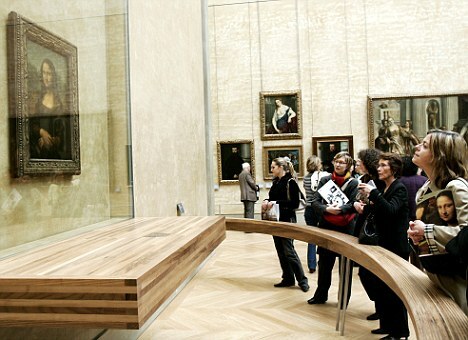 I’ve been told it’s almost impossible to get to the front of the rail to see the Mona Lisa, for instance, at the Louvre. Plus, the painting itself is pretty small!